The Taliban claims responsibility for blasts in downtown Kabul, as US Black Hawk aircraft enter to patrol the area. 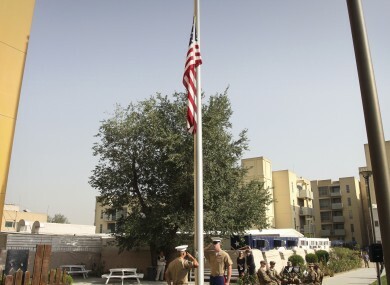 Flags fly at half-mast in the US embassy in Kabul last Sunday. The embassy is among buildings targeted by a Taliban assault today. THE TALIBAN has claimed responsibility for a series of explosions in the ‘embassy district’ in Kabul, the capital of Afghanistan, this lunchtime. A number of high-profile embassies, including that of the United States, were immediately guarded by heavy security as attackers with rocket-propelled grenades fired at severla buildings. The New York Times said the US embassy, and a neighbouring building used by NATO, were the main targets of the attack. At least 10 different explosions have been heard. An Afghan government spokesman said two attackers, and one policeman, had been killed. A member of parliament said that two large blasts had been observed near the national parliament building. The Daily Telegraph quoted a senior police official who said there were five attackers involved. They had taken refuge in an unfinished high-rise building, from which they were exchanging occasional gunfire with Afghan forces. The BBC said marines had been seen on the roof of the US embassy to ensure that its buildings defences were robust. That embassy is on the edge of the Wazir Akbar Khan area, and gunfire and explosions rocked the area, which is home to a number of other foreign missions. Britain’s foreign office said it had accounted for all of its Kabul staff. At least one rocket landed on a building housing privately owned Tolo TV and another near a minivan carrying school children. At least four Afghans were wounded in that strike, according to Associated Press reporters on the scene. Taliban spokesman Zabiullah Mujahid said a number of suicide bombers were attacking Afghan and foreign soldiers at the square. He claimed in a text message that suicide bombers using assault rifles were attacking the offices of the Afghan intelligence service. NATO chief Anders-Fogh Rasmussen has described the attack as an attempt to disrupt Afghanistan’s security transition from a US-led coalition to domestic hands. Email “Taliban claims responsibility for attack on embassies in Kabul”. Feedback on “Taliban claims responsibility for attack on embassies in Kabul”.